Looking for picture books about unicorns, or chapter books about unicorns for your older readers? If you have a unicorn obsessed little one at home, you’ll get major props in your house if you pull these stories off your shelf. So what are you waiting for? Check out these magical books today! Stay on Trend With These Picture Books About Unicorns! What on earth is it about unicorns these days? The unicorn obsession is gripping the world and everywhere we look, unicorn magic is evident. From cakes to clothes, headbands to jewelry, these magical creatures are all over the place. And guess what?? Unicorns are embracing the covers of books, too, and these picture books about unicorns are just as magical as you would guess. Picture books about unicorns are wonderful, so don’t knock ‘em! First, unicorns aren’t real. So when our kids are dreaming about, talking about, and reading about unicorns, they are using their imagination. And there’s nothing more incredible than that. When kids exercise their imaginations, not only are they exercising their brains in the best way possible, but playing “pretend” allows them to explore relationships between family and friends, learn valuable communication skills, and even help them work out their fears and worries. Two, these magical creatures, though, fake, can teach our kids very real — and very valuable lessons. The stories on this list convey important messages about self worth, learning to be comfortable with differences, discovering where we fit in, and learning to love and embrace our own unique qualities. After all, being a mythical, magical creature may not be all it’s cracked up to be, from a unicorn’s perspective! Three, if they want to read about unicorns, let them read about unicorns! Why? They are reading! Our goal as parents and educators is to help children fall in love with reading, and one big way to do that is to give them choice. Whether it’s trucks, Paw Patrol, Moana, unicorns or Dog Man, let them read what they want to read. This builds the foundation for a love of story. So what are you waiting for? Grab these books and get to reading! Picture Books About Unicorns: For the Littlest Readers! I’m a Unicorn (Little Golden Book), by Mallory Loehr and illustrated by Joey Chou: Your littlest readers will absolutely delight in this sweet picture book about unicorns, part of the reputable Little Golden Book series which has been around for more than 75 years. In this book, with simple text and adorable illustrations, toddlers will meet a unicorn who provides a perfect first introduction to these magical creatures. Unicorns are Real! by Holly Hatam: This is another unicorn book perfect for toddlers! In this adorable board book, your littlest unicorn lovers will learn all about the magical, whimsical world of unicorns! From the eight special ingredients that make up a unicorn, to the way they polish their horns with fairy dust and wear gold on Sundays, toddlers will absolutely delight in this fun and “factual” book! 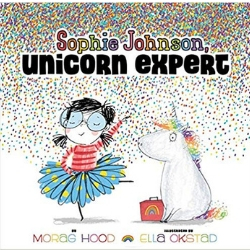 Sophie Johnson Unicorn Expert, by Morag Hood and illustrated by Ella Okstad: Oh, how I adore this book about one little girl who is an expert in unicorns - or so she thinks! Sophie believes she knows everything about unicorns, and she therefore teaches all of the unicorns in her house (namely, the stuffies, pets and dolls she has dressed up and turned into these magical creatures!) how they should do magic, what they should eat, and even that their pointy horns can burst balloons. But does Sophie really know everything about unicorns if there is one right under her nose that she fails to see? This one is such a treat, and so very much fun! Uni the Unicorn, by Amy Krouse Rosenthal and illustrated by Brigette Barrager: Amy Krouse Rosenthal can do no wrong in my book, and this sweet, poignant story hits all the right notes for me. In this story, forget all you think you know about unicorns. Why? Because this is the story of a unicorn who truly believes little girls are real. Though Uni is told there is no such thing as little girls, she knows that somewhere, somehow, she will find a real little girl just waiting to be her best friend. Do wishes come true? Cue heart melting here! You Don’t Want a Unicorn, by Ame Dyckman and illustrated by Liz Clime: Boys love unicorns too! And if you have a son at home or a boy in your classroom who is loving these magical creatures, this picture book about unicorns is the one for him. Here, a boy throws a coin into a wishing well, and he wishes for a pet unicorn, of course. But when his wish is granted, chaos ensues! Unicorns are a lot of work. Their horns poke holes in the ceilings! They shed! And they certainly can’t be house trained. This one is a riot… and guaranteed to make your little ones erupt in laughter! Do You Believe in Unicorns?, by Bethanie Murguia: Hmmm. Is that horse wearing a hat? Is he having a bad mane day? Or, could it actually be… a unicorn? We absolutely love this book about imagination, magic, perspective, and seeing one everyday animal in a magical way. Witty, wry and oh so playful, this book will have kiddos giggling and their parents delighting in the narrator’s skepticism. Love the illustrations and the way they elevate this adorable picture book about unicorns to a whole new level of fun! A Unicorn Named Sparkle, by Amy Young: Lucy sees an ad for unicorns - only 25 cents! So she buys one and waits with bated breath for it to arrive. But when Sparkle arrives, he is short, spotted, flea ridden, and more goat than unicorn. Lucy is less than impressed and thinks she should send him back. But then… she realizes that even though Sparkle wasn’t what she had been expecting, he’s awfully sweet, and maybe just what she needed after all. Thelma the Unicorn, by Aaron Blabey: Thelma the pony wishes for nothing more than to be a unicorn. And then one day, with the help of a carrot and a runaway truck filled with pink paint and sparkles, Thelma’s very wish comes true. She’s pink! Sparkly! Horned! Perfection! But being a famous unicorn isn’t all that she thought it was cracked up to be, and Thelma realizes that being plain old Thelma is better than anything else. A perfect picture book about self-worth and acceptance! Not Quite Narwhal, by Jessie Sima: Kelp grew up in the ocean where he always believed he was a narwhal. Sure, his tusk was shorter and he wasn’t a great swimmer, but he was a narwhal like the rest of his family! But then one day, a strong current carries Kelp to the surface, and there he discovers a glorious creature that looks just like him. Could it be that the two are actually unicorns? This is an adorable story (beloved by my students and on constant rotation in our library!) about discovering who you are, where you fit in, and, most importantly, love of family. Unicorn Thinks He’s Pretty Great, by Bob Shea: When Unicorn arrives in town, Goat gets himself in a tizzy. Goat’s bike is no longer cool because Unicorn can actually fly to school. Goat’s marshmallow treats were almost really good, but Unicorn made it rain cupcakes. Unicorn can even makes things turn to gold! Will Goat ever measure up to this magical new creature? Or will he discover that being a unicorn may have some very real — and very challenging — drawbacks? Unicorn Wings (Step into Reading), by Mallory Loehr and illustrated by Pamela Silin-Palmer: If you have a unicorn lover at home who is ALSO starting to read on her own, this is the perfect book for beginning readers! Unicorn can make rainbows. Even cooler? He can heal wounds with his horn, but what he really wants is to fly! Unicorn thus sets off on a quest to find himself some wings. This one is adorable, and a favorite new gift for unicorn-obsessed kindergarteners! If your kids are mastering sight words and decoding on our own, Unicorn Wings and these other beginning readers will be perfect! Zoey and Sasaffras, Unicorns and Germs, by Asia Citro and illustrated by Marion Lindsay: Zoey and Sassafras is an easy chapter book series that has it all - magic, science, adventure and lots of animals. In the first book, Zoey learns a shocking discovery— wounded magical animals find their way to her backyard! Each story in this series of easy chapter books thus features a new magical animal - and discusses how science can help solve each problem. This installment is all about the arrival of an enormous unicorn — he’s in a lot of pain and getting worse every day. Will Zoey and her mom be able to help? If your kiddos are ready for Zoey and Sassafras, make sure to check out our list of easy chapter books! Phoebe and Her Unicorn series, by Dana Simpson: Graphic novels featuring unicorns? But of course! One day Phoebe skipped a rock across a pond… and she hit a unicorn in the face! As a result, Phoebe, for some unbelievable reason, gets to make one wish! So she wishes that this unicorn will become her best friend. And so begins the story of Phoebe and Marigold Heavenly Nostrils. But Marigold is a bit vain, and Phoebe has her head in the clouds. Will they ever find a true connection? 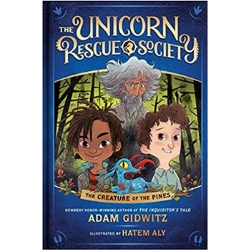 The Creature of the Pines (The Unicorn Rescue Society series), by Adam Gidwitz and illustrated by Hatem Aly: Are you ready to protect the mythical unicorn? If so, the society needs you. Quickly! Elliot and his new friend, Uchenna, are about to embark on a journey with a secret group of adventurers, The Unicorn Rescue Society. Their goal? Protect and defend the world’s mythical creatures. If your kids like unicorns, fantasy, AND adventure, this series is a must! The Unicorn Quest, by Kamilla Benko: Called “stellar” by the New York Times and hailed as a book to hand to kids who love Narnia, this is the story of sisters — one who lives in the real world and is searching for the other in Arden, a fantasy land full of magic and turmoil - a land where the unicorns have disappeared. Will Claire be able to find Sophie and uncover the unicorns’ greatest secret? The Magical Unicorn Society Official Handbook, by Selwyn Phipps and illustrated by Helen Dardik, Harry Goldhawk and Zanna Goldhawk: Oh. My. Goodness. This book is gorgeous, and if you have strong elementary readers at home, they will fall in love with this unicorn guide. Containing facts, fiction, and everything your child would want to know about these magical, mythical creatures, from the food they eat to the way in which they must be trained, this is a must have read for your unicorn loving kiddos, one they are guaranteed to love! So unique, fun and fabulous! DID YOU LIKE THIS LIST OF PICTURE BOOKS ABOUT UNICORNS? WE THINK YOU WILL LOVE THESE TOO! Best Books for Beginning Readers- The Ultimate List for Kids Starting to Read! Books About Strong Girls: A Huge List of Favorite Children’s Books!